Visitors to Atlanta marvel at the pace and volume of traffic, especially on our many interstate highways. The Georgia capitol city is the center of State government, a huge transportation hub (highways and airport), and an internationally-known entertainment venue. These many factors create millions of vehicles generating Atlanta traffic every day, clogging the highways. Especially during rush hours (morning and afternoon) it is common to encounter an accident in Atlanta, with every variation of severity from fender bender to tractor trailer fires. Keeping track of Atlanta traffic is a job tackled daily by Atlanta’s local and satellite radio broadcasts, television news, internet sites, and even state highway signs above our interstates. Even the early morning news stations, during weekdays start broadcasting at 4 AM, telling commuters where highway construction is occurring, or warning drivers to take an alternate route to bypass an Atlanta accident location. In an effort to keep the cars and trucks moving, some traffic alerts will describe the roadways to avoid, or explain how to detour around problem areas. Due to this massive amount of traffic, Atlanta-area courts deal with many motor vehicle accidents that lead to traffic tickets. Plus, in an effort to slow down speeding cars, the Georgia State Patrol and Atlanta Police maintain a highly visible police presence, and write hundreds of traffic tickets every week. The City of Atlanta is so large that parts of it are located in two counties, Fulton County GA and DeKalb County GA. If you were issued a traffic ticket or arrested for a DUI or other serious traffic offense when driving a motor vehicle, or were in a car crash, this is where your case will start. Minor traffic offenses can be processed online, but a more serious traffic offense in Atlanta requires a court appearance. One of the busiest traffic courts in America, called the Atlanta Municipal Court, is in downtown Atlanta, GA at 150 Garnett Street. Revenues for this Traffic Court go to the City of Atlanta treasury, and not Fulton County. Any traffic ticket in the unincorporated part of Fulton County, GA, that is not inside the city limits of the City of Atlanta, Georgia, are processed in nearby Fulton County Magistrate’s Court, which is located on the northeast corner of the intersection of Pryor Street and Mitchell Street. 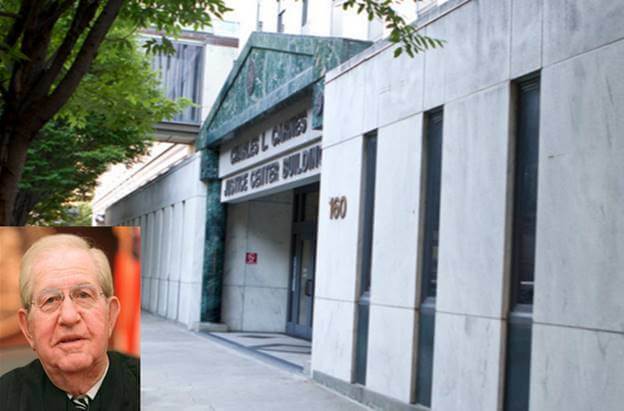 The building housing this court (and other government offices) is named the Charles L. Carnes Justice Center Building, and the street address is 160 Pryor Street, SW, Atlanta, GA 30303. The person this building is named after, Charlie Carnes, was a long-time, highly-respected Judge in Fulton County, and a Georgia legislator prior to that. He died in 2013 at age 86. LOOK at your traffic citation to determine where you need to be, because people get confused when they have not tried to deal with the criminal justice system before. 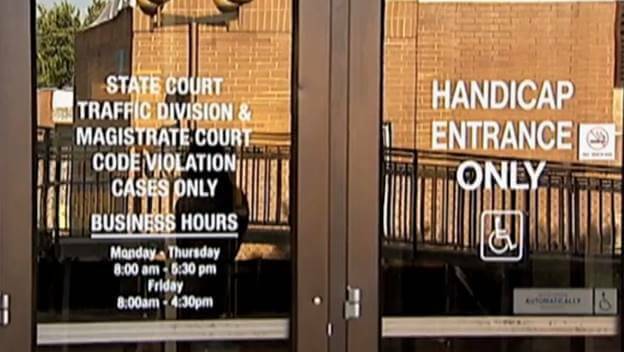 The two downtown traffic courts (Traffic Court Atlanta and Fulton County Magistrate’s Court) are only two blocks apart, but being late for court can get you in hot water. Until a few years ago, ending July 30, 2015, DeKalb County ran a Recorder’s Court for non-serious traffic offense cases like speeding, red light violations, and lane violation. The DeKalb Recorder’s Court was operating out of its Camp Circle court location for many decades. That Recorder’s Court now has ceased to exist. Some of the staff and personnel were consolidated into the State Court of DeKalb County, GA, but new judges were appointed. 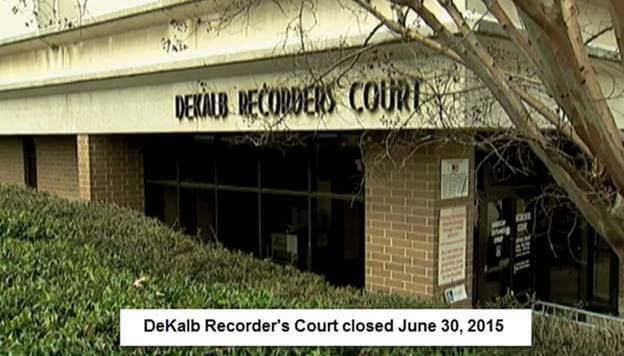 A civil litigation suit, class action, was filed in July of 2015, seeking damages for the DeKalb Recorder’s Court unlawfully collecting fines and punishing people for offenses that this Court lacked subject matter jurisdiction to adjudicate. Now, the Solicitor of State Court processes all traffic tickets issued in unincorporated DeKalb County, GA cases, under its Traffic Division. So, the same building at 3630 Camp Circle, Decatur, Georgia is where a person with a DeKalb County traffic ticket (when arrested in the county and outside the Atlanta City limits) will have you to report. Also, for any transfers of misdemeanor traffic tickets from a DeKalb County City of Atlanta Municipal Court jury trial bindover will go to State Court of DeKalb County, but at their 556 North McDonough Street, Decatur, GA 30030 address, within the DeKalb County Courthouse. Some types of Atlanta motor vehicle offenses, like DUI, hit and run, attempting to elude, driving on a suspended license, or driving without insurance will be traffic offenses that require a police officer to place you under arrest. About 90% of clients who hire our criminal defense law firm have been arrested and taken to jail in Atlanta, or (when trying to pay a ticket online) learn that their serious Atlanta traffic offense requires their appearance in court. This is where our criminal lawyers usually get hired to assist. If you were in a car accident and received a traffic ticket, have accumulated points on your driving record, or are charged with a more serious offense such as driving under the influence, don’t go to court alone. These types of traffic offense cases can mean major problems, in both the criminal case resolution and for settling any possible civil case (i.e., being sued for a car accident). If you plead guilty to the criminal case (traffic citation), this plea is an admission against you, and can create problems in your civil case, especially if you were uninsured, or personal injury claims may exceed your existing insurance coverage. Because traffic accidents create criminal law and civil law complications, the time to contact us is “immediately.” In serious injury cases, certain steps can be taken to try to resolve an accident case in either DeKalb County Traffic Division (State Court), Fulton County Traffic Court (Magistrate’s Court), Atlanta Municipal Court, or Cobb County State Court before the situation worsens. When you call us, have your Atlanta traffic tickets in front of you, plus (with traffic accidents) your auto insurance “declaration” page, showing your amounts of coverage for each accident, and per person limits. If you have been charged with a traffic offense, call Atlanta Traffic Attorney William C. Head at (404) 567-5515. Our office primarily handles DUI arrests, but we also handle Atlanta traffic tickets.